New for 2015! Social Commerce Tactical Guide. Get Yours, Now! | ASTRALCOM - Content Strategy, Conversion Marketing and Customer Acquisition. Conversations lead to relationships and relationships lead to mutual goals and mutual goals lead to fulfillment. If you give your target audience something to talk about, then you’ve helped spark that conversation. That doesn’t necessarily mean that the conversation will be between you and the other person. It could between friends, family or co-workers about your very product or service. Indeed, that very conversation could be the start of something viral. 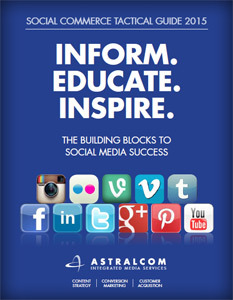 Download your own FREE copy of ASTRALCOM’s Social Commerce Tactical Guide for 2015 right now.